Power Star Pawan Kalyan, the chief of Jana Sena Party enjoys mammoth Fan following. Unlike other heroes Fans, Pawan Fans boast that they have another religion called Pawanism. Many times they shocked anti Fans in the name of Pawanism by disrupting the speeches of various celebrities at film functions demanding thay they sing praises of Power Star. Right thinking people asked Pawan Kalyan to rein in his fans but Pawan remained silent emboldening them even more. They used to enter into slugfest and quarrels most of the time. It seems now Pawan himself is getting troubled by his over enthusiastic fans. Inside talk says, Power Star expressed anger on his Fans during Andhra Pradesh tour. 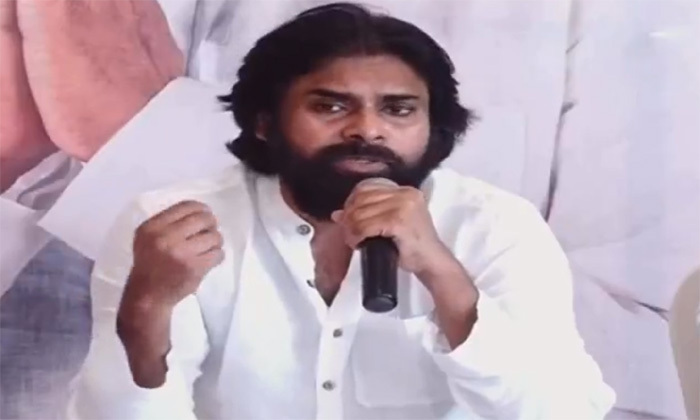 Pawan who delivered a fiery speech during Jana Sena Kavatu when his fans shouted 'CM Pawan' slogans has simply neglected them during Srikakulam visit. People of Santakaviti Mandal, Srikakulam district have been protesting for more than 610 days for a bridge over Nagavali river. Pawan met the protesters and pledged his support for their demand. During that time Pawan Kalyan fans and Jana Sena supporters chanted Pawan Kalyan CM, future CM Pawan. Pawan tried to stop them many times but with fans unrelenting he turned furious and thundered 'Are you mad or crazy? Are you not human beings? Here people are fasting for so many days and it is not right to shout such slogans?' Pawan's fury has literally left his fans choked. Pawan's fans are angry with Power Star for reprimanding them and are heard questioning why was he practicing double standards and encouraging fans to shout CM Pawan slogans conveniently and now showing his anger just because they are his diehard fans.